Norman’s Ray of Sunshine walk. 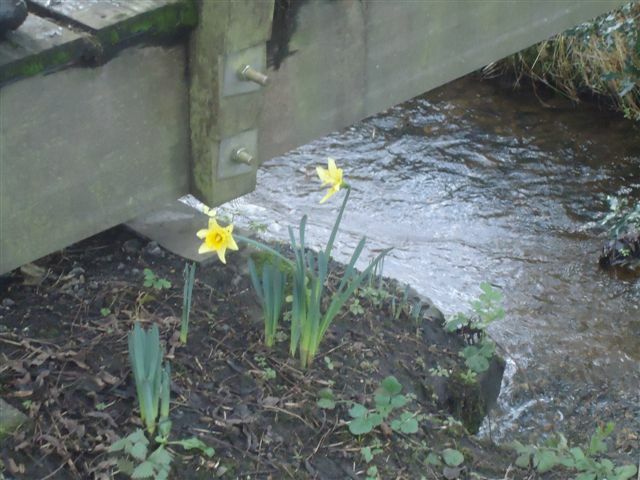 A group of 20 of us met in the car park of the Blundel Arms, Horwich, for the start of the first East Lancs walk of 2012. Soon after 08:30 Norman asked us to gather round and explained the background to the walk. Some years ago a friend of his was terminally ill and was very impressed with his respite visits to Bolton Hospice, describing these visits as a ray of sunshine. Norman and John Howarth devised this walk and have run it to raise money for Bolton Hospice over the past few years, raising several thousands of pounds for the hospice in the process, in memory of their friend. The walk goes from the Blundel Arms to a sister pub the Malthouse Farm near Chorley and back again. So off we set and as often is the case, the only way was up. We climbed steadily to the TV masts on the top of Winter Hill, where we re-grouped and an impromptu quiz was held by Kath Page; the prizes were bars of Cadbury Fruit and Nut. 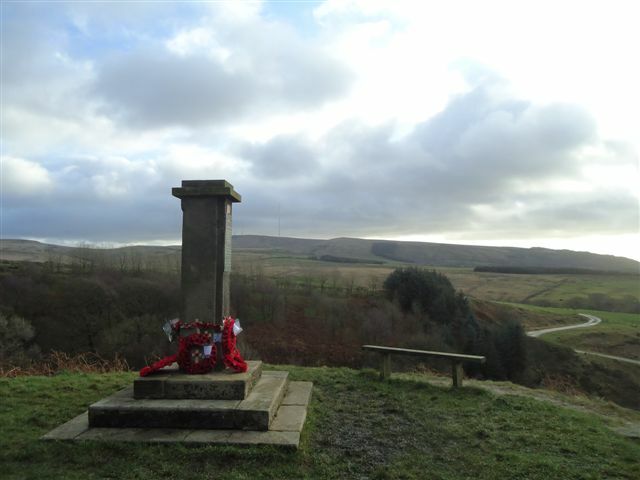 We pressed on north and the east to arrive at the military memorial at Lead Mines Clough, where a morning coffee break was enjoyed. It should be noted at this point that Norman had arranged the weather to mirror the walks title and we did indeed have plenty of rays of sunshine. Continuing on, generally north and east we passed through the delightful White Coppice and eventually came to our lunch destination, Malthouse Farm on the outskirts of Chorley, where some tables had been reserved in the pub for our use. Here we meet Steve’s dad, Alf Clark, and partner Sue, who joined us for the afternoon. Bowls of soup were ordered, with plates of chips for each of the tables. Some of the hardier of our group availed themselves of the tables and benches on the decking outside the pub. Refreshed we now headed towards home, walking south, initially along the Leeds and Liverpool Canal. Leaving the canal banks we headed up to Healy Nab and again enjoyed rays of sunshine admiring the view whilst getting our breath back. 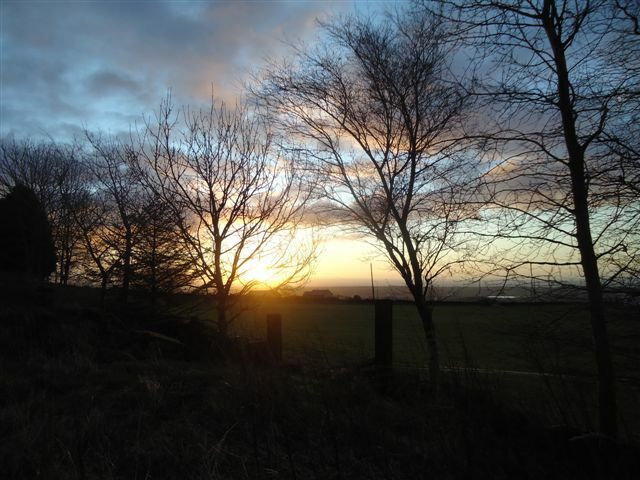 The route now took us down towards Anglezarke Reservoir and Rivington village. A brief coffee break was taken near the bottom barn at Rivington. Pressing on we walked towards the south east as we skirted to the north of Horwich before emerging onto Chorley Old Road and back to our start point, the Blundel Arms. Thanks to John Bullen for the pictures. 24 pairs of legs (22 + Maude) met promptly for the 8.41am train at various times….mainly due to the busy traffic conditions caused by poor weather. Fortunately the 8.41 train was promptly late, arriving sometime after 9am sharp. To add insult to injury our train broke down entailing a change of train at Wigan. Northern Trains continued their assault on our delicate senses by treating us to the rudest train conductor in the world. Oh well, the object of the day was a Top Secret Walk, not a train journey. Another train journey, this time by Mersey Rail, took us to the start of our secret journey at Ainsdale – famous for the Irish Sea being a long way away. I’m not sure what the new faces - Chris, Bernard and Julie made of our little party but they didn’t complain and they may even come back again. They joined in the spirit of the day, splish-sploshing along with the rest of us. John Pickton, a fine figure of a man (in normal circumstances) guided us through the rain-sodden streets of Ainsdale and down to the beach. After insisting that we all test the waterproof qualities of our footwear and a quick photo-shoot, John led us off on a route known only to him. We set a good pace, stopping only at the local petrol station. Quite convenient really. After leaving the tarmac our confidential route took us across Halsall Moss – the first of many mosses that day. The map shows very few contour lines so Norman (51) was surprised to see Shirdley Hill on the horizon. We ascended the hill’s flanks to the lung-bursting altitude of 10m above sea level. We continued our ascent until we reached our lunch stop at Scarisbrick Hall School (15m ASL). Although the school is only 50 years old, the beautiful building it occupies is significantly older. The expedition secretly crossed muddy fields bordered by ditches and cuts, the Leeds – Liverpool Canal hove into view. Heading east along the towpath the party was halted in its tracks near to a decrepit swing bridge. Norman had spotted a pub and he took some considerable persuasion to continue the walk. No sooner had we succeeded in getting him moving again, another pub appeared – the Slipway (Thwaites). A vote resulted in the party moving off once again, this time to the end of the walk at Burscough. Some of the party made straight for the railway station to head for home whilst others headed for the Infusions café where they were royally looked after. John succeeded in his objective of keeping his walk secret – most of us didn’t have a clue where we had been! Sunday 15th January 2012. Trespass Retraced. Leader: Bob James. 42 walkers and 4 dogs. My heart-felt thanks to the 42 ( yes, forty two!!) who turned up for the Trespass Retraced walk which, given its correct name, is the official “Trespass Trail” running through some of the best countryside Derbyshire has to offer. This is only a 14 mile walk though what it lacked in length it made up for in its beauty. The cold frosty morning did little to dampen the enthusiasm of this multitude with guests from other branches of the LDWA, including South Manchester and West Yorkshire. With frosty mornings come brilliant blue skies which rewarded the group as we followed the River Goyt before ascending up through Hague Bar and skirting Shaw Marsh golf club. Swinging down across the fields towards Rowarth, a brief stop was made at what was the “Children’s Inn” before it became a private home. The significance being that it was here that Ramblers set off in early 1932 to walk the hills only to be turned away by Gamekeepers who denied access to what was deemed private land. The seeds of the now famous Kinder Trespass were sown at this point. Our 1st stop was made at the quaint “Little Mill” with expansive outdoor seating. The Landlord very kindly opened his doors for us to use his facilities and thanks were expressed for his hospitality. Well worth a visit if you fancy a ride out into the Peaks and you have never been there before. On we pressed upwards to skirt around Lantern Pike and down into Little Hayfield, crossing the A264 and then on into Park Hall and Middle Moor. Once the climb had been achieved it was a brief trek to gain full view of Kinder from the path high above Kinder Reservoir. Here we broke for lunch and were treated to a flying display of a helicopter journeying back and forth; carrying renovation material up onto the Pennine Way away to the north. Dropping down we then began retracing the path taken by the Trespassers of 1932, making our way to Bowden Bridge car park – which in 1932 was a stone quarry. Here we saw the Memorial Plaque high on the quarry wall commemorating those who had ultimately brought about a change in legislation that we all now benefit from. Moving on – an additional treat was had in Hayfield as we paused briefly outside the birthplace of much loved comedian and actor Arthur Lowe; better known as Captain Mainwaring from “Dads Army”. Another brief stop at Hayfield Tourist Centre which had once been the railway station. Free guides to the very walk we were doing were quickly snapped up so I’m assuming someone else is going to lead this walk next year. The final stretch followed the now disused railway line. We arrived back still in daylight; refreshed, unusually dry and glowing with the abundance of fresh air, copiously consumed from a very memorable day. Thank you to all those who expressed their thanks. Thanks to Andy for some pictures in the gallery above. Sunday January 22nd. Cuerden Wander. 15.5 miles from Cuerden Valley Park. 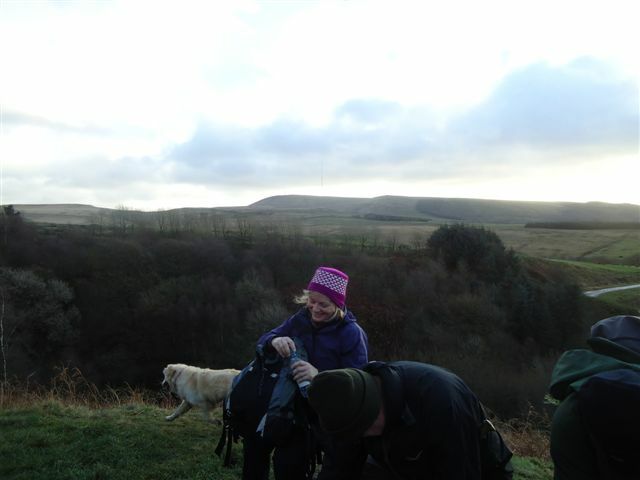 Leader: Hilary Scott: 29 walkers and 7 dogs. A forecast of strong winds and showers was not enough to deter a large group from turning out for this introductory walk. Most people were stalwarts of the LDWA but we did have some newish members. 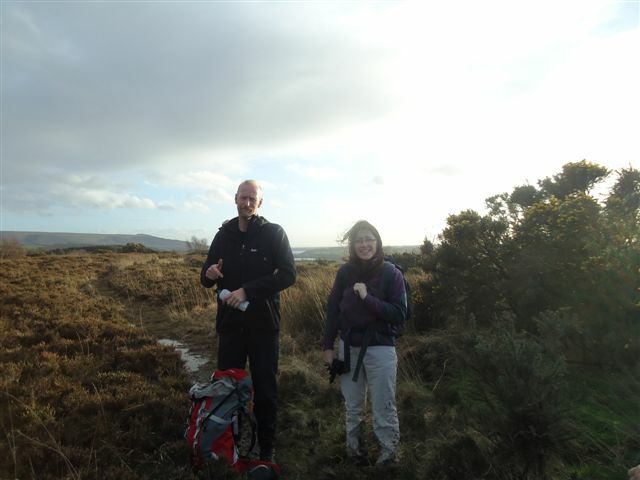 Mick from Colne who had never been on a social walk before was brave enough to bring his wife to join us! Most of the first hour was spent in the shelter of Cuerden Valley allowing a good pace to be set. Many members had not visited this area before despite it being fairly close to home. We saw Cuerden Hall now a Sue Ryder Home, and visited the remains of old Old Kem Mill. Leaving the park we made our way up through Whittle-le-woods where the vista opened up to give views across to Rivington and Winter Hill. A short road walk was rewarded by morning coffee at Top Lock. Continuing along the canal we passed Withnell Fold with its redundant paper Mill and looked at some Thirlmere Way gates, teaching those not in the know about the history of that particular expedition! 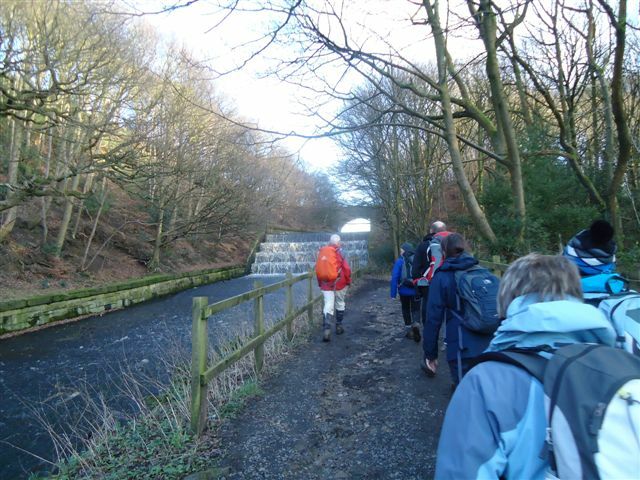 The canal was left at Riley Green and we made our way down to the River Darwen behind Hoghton Tower. The weir was in full spate and the path very muddy after recent rain. We made our way under the railway arch and contoured round and up to eventually reach the driveway to Hoghton Tower. Those who had not visited this building before were suitably impressed. Lunch was taken at the War Memorial but we were now in the wind having been sheltered most of the morning. Passing through the churchyard and over some fields were windy and cold but we did spot some more Thirlmere Aqueduct gates to make up for this. There was now a section of road walking, more than on my original plan as the fields were just so muddy. Eventually we turned towards Cuerden Valley, passed back under the motorway with a chocolate fix to help us along. We walked through Clayton Brook and made our way back into the Park with a look at the lake set below the Hall which had not been visible on the way out. I must have set a good pace as we were back at the cars before 3pm just in time to avoid the only real heavy shower of the day. Thank you to all who came. Sorry for being such a liar - "the trains don't run on Sunday" - along came a train! "This is a quiet lane, no traffic -" along came a milk van! "Not much mud on this walk" - we found some! Let me know how many points have been deducted. 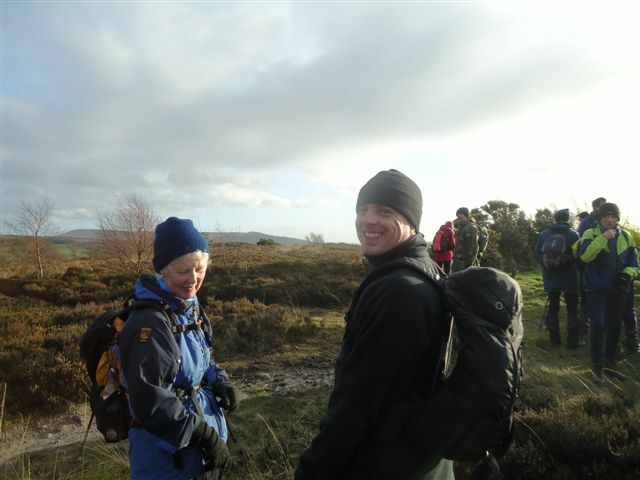 Thank you to Andy who has sent some pictures from this walk. Wednesday January 25th. Hurst Green Hike. 13 miles from Hurst Green. Leader: Helen Ditchfield. 33 Walkers and 7 dogs. The day dawned bight(ish) and sunny(ish) after a previous day of constant rain. The car park at Hurst Green village hall began to fill steadily after 9.15 and soon there was a gaggle of 29 walkers and 7 dogs. The group posed for a photo on the steps in front of the village hall and all was well. I (Helen Ditchfield) described the walk route and asked for a volunteer for someone to be back marker and was met with deadly silence. At that moment a late car drove onto the car park and amongst the four occupants was Norman (of Stormin fame) and some bright spark declared ‘Norman will be back marker’. So Norman was instructed of his duty and as he looked round he declared ‘There’s a lot of folk here, Helen. They obviously don’t know you’. From the car park we headed up Longridge Fell and had a coffee break at the trig point. From there we trudged through bogs along the ridge and a few people did impressive landings in the stuff. It was then that I learned about the ‘points system’ and that the 20 points that I had begun with at the start of the walk were diminishing rapidly. From Longridge Fell came a length of road walking (more points lost) until we joined the path along the River Hodder at Higher Hodder Bridge. Lunch was at a nice spot along the River Hodder but more points were lost as there was a lack of rocks to sit on and the mixed mint sweets that I offered after the repast were apparently like cough medicine. So…. Onwards through more mud to Lower Hodder Bridge (and Cromwell’s Bridge) then through more slime to the River Ribble and back along it through yet more mud (even more points lost) to the car park at Hurst Green. Norman announced that in all his years of walking he had never been on one which had ended up completely pointless. So with that some people headed for home and 14 of us headed for drinks at the Shireburn. I was glad that I had led a pointless walk. It could’ve been a lot worse; had I gone into minus figures I would, apparently, have had to buy drinks for everyone. Phew!